Sabyasachi Mukherjee, who designed the outfits for Priyanka Chopra and Nick Jonas' Indian wedding, shared on Monday how the groom's customised sherwani was made. He had posted the details about Priyanka's red bridal lehenga soon after the wedding. In two Instagram posts, the designer revealed that the couple wanted an 'understated' sherwani for Nick. "Murshidabad silk was yarn-dyed and hand-spun to create a soft and luxurious quilted sherwani. Bengal tiger buttons in gold, encircled with Japanese cultured pearls were the baroque accents," read a statement posted by Sabyasachi. He also shared a video of how his team made the Burma-Ivory sherwani for Nick Jonas. Nick was also 'excited' to carry a sword and so, a "statement piece in steel and gold with a custom sheath encrusted with pearls" was crafted for him. Nick carried a chikankari shawl with him. Watch the making of Nick Jonas' wedding sherwani. Here are the details posted by Sabyasachi. ICYMI, watch the making of Priyanka Chopra's wedding lehenga here. 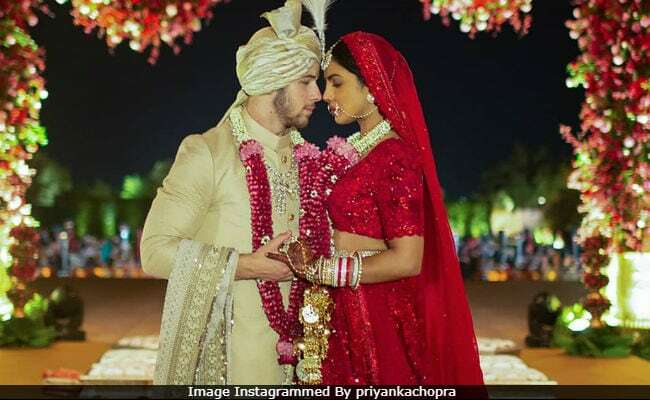 Priyanka Chopra and Nick Jonas married at Jodhpur's Umaid Bhawan Palace earlier this month. On December 1, they married as per Christian rituals and on December 2, they exchanged their wedding vows in a Hindu ceremony. Ralph Lauren designed Priyanka and Nick's outfits for the Christian wedding. Take a look at the pictures from their wedding ceremonies. Priyanka Chopra and Nick Jonas hosted a wedding reception in New Delhi two days after the wedding. The function was attended by Prime Minister Narendra Modi and other dignitaries. Their Mumbai reception is scheduled to take place on December 20.